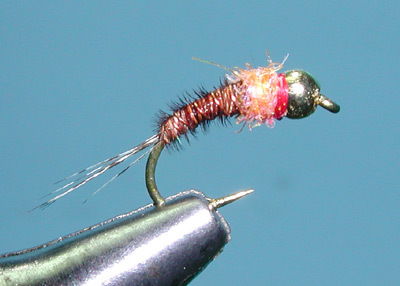 Notes: The Frenchie nymph is a variation off the Beadhead Pheasant Tail nymph. I am not sure who came up wih this variation as both the English and the French have used this pattern for some time. 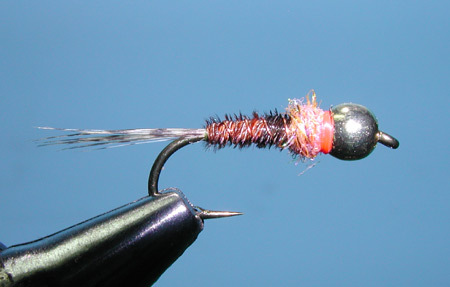 In competition, this fly has been outstanding and came to the attention of our own Team USA members, George Daniels and Lance Egan. Lance adapted the pattern to a scud style hook offering smaller sizes and has often been credited with the pattern design. Used within European style nymphing techniques such as Czech or French nymphing, the Frenchie has been adapted to sink rapidly within the water column with a slender profile. It has a Tungsten bead as well as leadfree wire backing the bead. 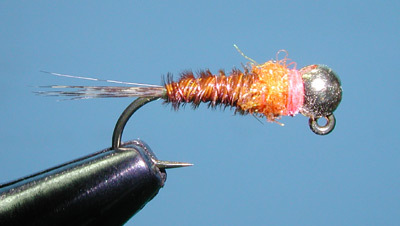 The tail is more durable than the Pheasant Tail Nymph with the use of Coq de Leon tailing fibers. 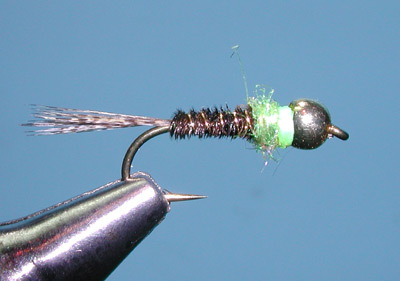 A key trigger mechanism for this pattern is the color of the Ice Dubbed thorax and the "hot spot" thread collar that is tied just behind the bead. 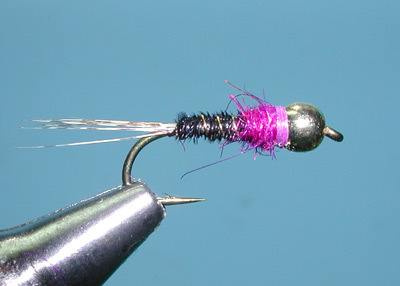 UV Pink Ice dubbing with a Fl. Orange collar is the most popular combination but other colors work as well in Olive, Purple, and Orange with corresponding thread collars of the same color. In recent years, Lance Egan has tied the Frenchie to a jig type hook which rides with the point up when bounced upon the bottom. This has reduced bottom snags and results in the fish getting hooked within the upper jaw behind the snout. This hook position allows the angler to retrieve the fish much sooner, particularly with Competition style hooks that have a longer point, by having much more control of the fish direction of travel. Tied to a size 18, the Frenchie makes a great BWO nymph pattern in the Sierra.